Construction has begun on a 100-unit apartment complex for young families in Mitzpe Yericho, about 20 minutes east of Jerusalem. 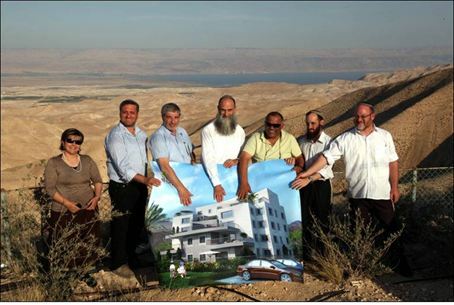 Construction has begun on affordable apartments for young families in the Judean community of Mitzpe Yericho. The project was launched this week by contracting firm Hotam Handasa in a ceremony held at the site. Laying the cornerstone were community leaders who included Bruria Francis, head of the Mitzpe Yericho Community Council, Avi Ro'eh, head of the Binyamin Regional Council, Rabbi Yehuda Kroizer, Chief Rabbi of the community, and others. During the first phase, 100 apartments will be built as part of a development that is expected to eventually include close to 1,000 units, according to real estate agent Shelley Levine. Home to more than 450 families, Mitzpe Yericho is located in the Judean desert, about 20 minutes east of Jerusalem along the Dead Sea, overlooking the Jordan Rift Valley and the ancient city of Jericho. The community is comprised of Jewish Torah-observant families, approximately 15 percent of whom are English speakers. The city is also home to the Jewish Temple School, where a full-size replica of the Holy Temple is under construction. Jewish men who are Kohanim -- descendants of the priesthood order with ancestry in the tribe of Levi -- will be able to learn the laws pertaining to the rites of sacrifice at the facility.